I am back with another sponsored lens from the AMAZING company Apple of your Eyes! As usual the owner is super nice and she always responds back to my emails. Shipping took 1 week and half but it goes by pretty quick if you don't think about it as much. After seeing a few people post up pictures of these lens I definitely wanted my own pair and lucky enough I got my own!! Without knowing what the diameter was I really thought these must be at least 15mm but turns out it's only 14.5mm!? Another thing I like about these lens is that the ring is not noticeable at all! Makes you look like you have natural turquoise eyes. 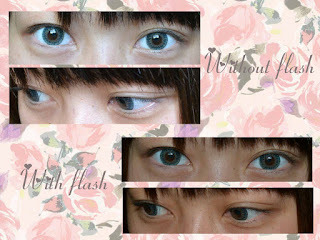 So for any of you guys searching for circle lenses more on the natural side I suggest these ones! They do look a little darker on my eyes since my natural eyes are a darker brown so the turquoise doesn't show as much on me. Looks more kind of greyish. But on lighter colored eyes like blue or maybe hazel it'll show a lot more. 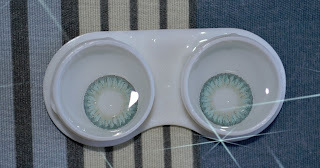 Since these lenses are smaller the comfort is pretty good. They stay pretty in place through out the whole day! I even went to see a movie at the theater with them on, in the dark!! And it felt like they weren't even there. Lucky for me I got another pair of the Gothic 3 Tones but in the color Hazel. This color really did make my eyes look lighter in person with natural lighting. Alrighty, so for anyone who wants some natural lenses and are new to wearing them I suggest these ones because it's really comfortable, design is not crazy with a big ring so perfect for those not into attention seeking lenses. So don't forget to check out the store and browse the different categories of lenses they have instock and available to buy!! cute i love the lenses!! i've been meaning to try green ones!